Not necessarily “in the forest” but kind of. Went for a walk while my truck was getting fixed in Kingston yesterday. Always see some really interesting trees there. 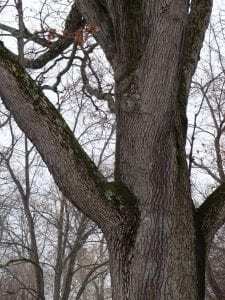 I saw one beautiful white oak with huge, outstretching “out-riggers” for limbs over a house. I thought about the immense weight in both that one limb and the strength required to hold it. Just think about those branch unions & how tough they must be to hold such a long lever. Amazing! 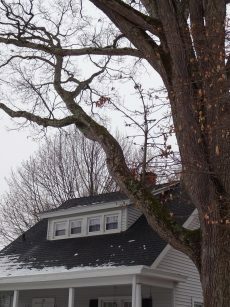 Tags: branch unions, Catskill Forest Association, Catskill Mountains, Kingston, trees, white oak Categories: What's New?